From the day our company was founded more than 50 years ago, PING has been a pioneer in custom club-fitting and a leading innovator in club design. 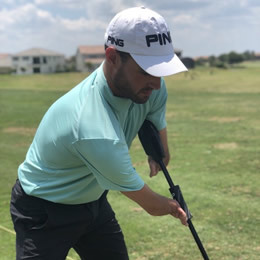 So it’s only natural that PING would enthusiastically embrace an Adaptive Fitting Program that custom-fits physically challenged golfers with specialized PING technology built exclusively for them. We are currently the only major golf club manufacturer with an organized adaptive fitting effort. Length – +3" to -3" can be built as standard product. Most lengths are possible through our PING Wrx department. Extreme lengths we’ve built recently: a 57” driver, and irons at 22". Lie – ±5 degrees can be built as standard product and bigger changes can be ordered on some models as a special order through PING WRX. 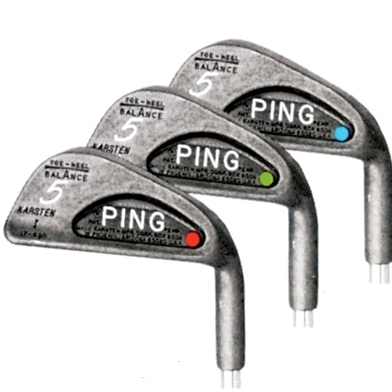 Weight – Weight can be added to the head using lead tape, tungsten or heavy CTP weights. Weight can sometimes be removed by using very light CTP weights or by grinding. Large grips – Our PP60 and PP62 putters grips are large diameter and lightweight and can be used on full swing clubs in some circumstances as a special order through PING Wrx. QUANTUM GRIP™ Velcro® grip and gloves – giving golfers a firm hold of the club for more confidence while swinging. Available through PING Wrx. Visit www.quantumgrip.com for more info. A special device has been created to help a player who cannot grip the club at all, e.g. a player with two prosthetic arms. Call Ping Wrx for details. Shaft Flex – In general, a very light, flexible shaft will benefit most golfers who have a slow swing speed. A list of PING retailers with adaptive fitting tools can be found here. Steve was one of the first wheelchair golfers we worked with starting in 2006. 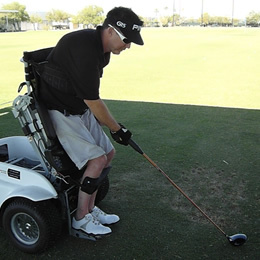 He plays from the Paragolfer electric chair which puts him in an upright stance to swing using just his right arm. He uses a Jumbo lightweight grip, similar to our PP62 putter grip, with Velcro glued onto the outside and paired with a Velcro glove. Most of his length, loft, lie specs are quite typical for any golfer with the exception of his very small “gardening tool” wedge which is built to 26” and allows him to chip from a fully seated position. Jeff approached us in 2008 and asked if we could help him get out on the course more regularly. 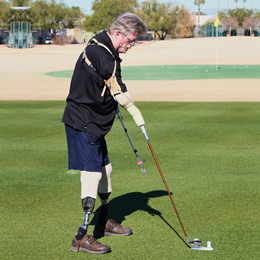 He is a quadruple amputee and uses a special device that screws directly into his right prosthetic arm to hold a golf club. Each individual club has a small metal protrusion in place of the grip which Jeff can push and turn so that it locks into place and is held firm with an internal spring. Jeff plays regularly and won a tournament at his club in 2017. Since making the device for him, the same attachment has now been used for a handful of other golfers. 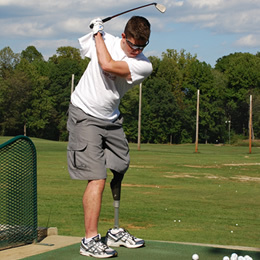 Ryan is a Veteran who we worked with as part of our support for the Warfighter Sports program. He swings the club with just his left arm in a right-handed stance – this is referred to as “backhand” style. We built his set with Quantum grips – they incorporate a spiral of Velcro to make gripping the club less of a physical strain over the course of a full round. These grips can be very effective with golfers who swing one-handed, or anyone needing a bit of extra help to grip the club. Adaptive fitting can come in all shapes and sizes. In 2018 our team in the UK built a full set for Britain’s tallest man. 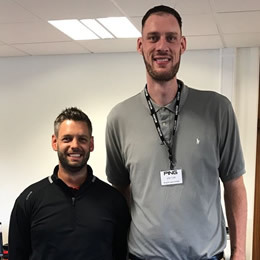 Standing at 7’6”, Paul Sturgess is literally “off the chart”, meaning we had to extend out our color code chart to compile a suitable initial length and lie angle for him. His irons are +4” while the driver is a USGA-maximum 48” and the putter is 44”. When we build a set like this it is important to pay close attention to the overall mass and swing weight of the clubs. His grips are also impressively large – our largest diameter Orange grip with 15 extra wraps of tape. We can’t claim too much credit for Andreas’ clubs – he came to us with a working prototype of a special “paddle” carved out of wood which he clamps under his arm-pit and uses plenty of body rotation to make a great swing. We were able to optimize the design using injection-molded plastic made at our headquarters in Phoenix and we paired the paddles with extra-long shafts to give Andreas a full set to cover all situations on the course. Andreas is playing as much as he can and has ambitions to play golf in the Paralympics one day. PING is pleased to be a sponsor of Warfighter Sports.